Crystal R. Lloyd is driven by a passion for defending the rights of individuals against mega insurance corporations. As a former claims adjuster for a Fortune 100 insurance company, Crystal was privy to the injustice individuals had to endure when faced with the seemingly insurmountable task of navigating the complex claims process and demanding fair results from insurance companies backed by goliath legal teams. Crystal has dedicated her legal career to assisting individuals overcome this inherent power imbalance. She utilizes her unique understanding of the insurance industry’s internal process for claims resolution to the advantage of her clients and has a demonstrated record of obtaining justice in the form of fair compensation for her clients. As an attorney with Herrmann Law Group, Crystal has successfully resolved claims for clients with injuries ranging from minor soft tissue to permanent paralysis. She currently manages the pre-litigation department and strives to resolve all her clients’ claims in the most efficient manner using informal negotiation tactics she has developed through the years as both an insurance adjuster and associate attorney. However, when informal negotiations prove futile, Crystal will fiercely advocate for her clients in court. Dauntless in the face of a challenge, Crystal has proven to be an invaluable member of Herrmann Law Group’s team of attorneys under the direction of senior litigator, Charles Herrmann, representing the family of Antonio Zambrano Montes (2015 police involved shooting in Pasco, Washington); several victims of the 2015 duck boat crash occurring on the Aurora Bridge in Seattle, Washington; 21 victims of the 2012 Mi Joo Bus Crash occurring just outside Pendleton, Oregon resulting in the death of 9 individuals and leaving 36 others severely wounded – some permanently crippled; 15 victims of the 2013 crash of Asiana Airlines flight OZ 214 occurring at San Francisco International Airport; 2 victims of the Amtrak derailment in Dupont, Washington; student marching band victims of the 2018 University of Washington bus crash occurring near George, Washington; and 22 victims of the deadly 2018 Lion Air Flight JT610 crash occurring over the Java Sea near Jakarta, Indonesia. 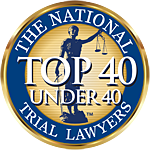 Crystal has been named one of the Top 40 Under 40 by The National Trial Lawyers due to her outstanding leadership and service to her clients. Crystal lives in Renton, Washington with her husband, Colin, and daughter Sierra. In her free-time Crystal enjoys pursuing all the Pacific Northwest has to offer. In the summers she can be found sailing around the San Juan Islands, camping in Olympic National Park, or hiking the mountainous trails of the Cascade Mountains. In the winters, you will find her skiing or snowshoeing near her home at Steven’s Pass. She also has a passion for photography and is rarely seen without her camera. Her favorite subjects are the landscapes of her travel destinations and, of course, her daughter.